The Wolfgang Detailer's Bag is a durable nylon bag for all your detailing supplies, including your polisher! 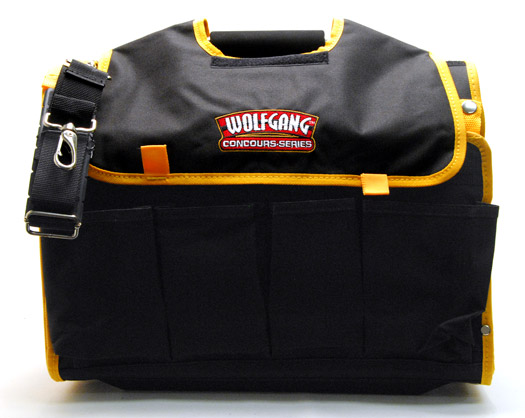 The bag has multiple compartments for products, towels, tools, buffing pads, and more. Heavy duty construction makes the Detailer's Bag perfect for carrying detailing supplies to mobile detailing jobs or car shows or to store your supplies. I am very pleased with this detailers bag. The bag is well constructed with plenty of pockets to hold liquid products. The separate compartment for foam pads is a nice feature. The carry handle is very sturdy and assembly of this handle went quickly. There is plenty of room for my PC polisher. I only wish they would offer a slightly larger bag to hold the Flex or Rupes machines.